First of all, you should play as much as you can, and watch other people play. Good players will not mind explaining things to you, unless they are really concentrating. There is an old Go Proverb that I was taught and I often repeat it: "Lose your first 50 games as quickly as you can." It sounds silly, but it says two things: first, don't expect to win for a while; and play as many games as you can. Stick to a 9x9 board, and play black. If you think you are not getting anywhere, don't be shy about asking for a couple of stones handicap. Another important tip - if you think you are losing, resign and start a new game. Don't get depressed about a losing game, get excited about the next one. You will soon start improving. There are many excellent books written in English and some in French and German too. The best places I know online for Go equipment and books are the Yutopian eStore and Slate and Shell . There are lots of other places too, including Amazon. Click on on the link and see the great selection they have. My favourite site for beginning players is Hiroki Mori's The Interactive Way to Go site. A Macworld article has reviews of many apps for play or learning here. 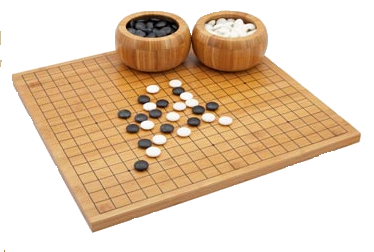 The American Go Association has a fine annotated list of books on Go. There are many specialized terms used in Go books and and articles, some of them are in Japanese. the Glossary (see above) has some recommendations. If you are looking for Go games to play on your computer, or mobile device, I can recommend Smart Games.